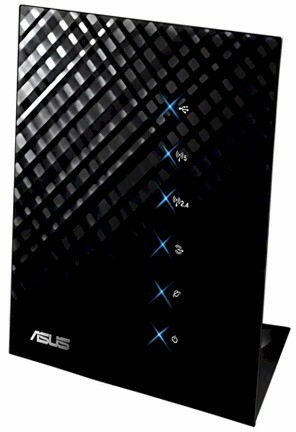 The RT-N56U is ASUS' new top-of-line wireless router. It is simultaneous dual-band 802.11n with four-port Gigabit switch and two USB 2.0 ports that support storage and printer sharing. It gets its "Black Diamond" nickname from the faceted diamond pattern on its front surface. The router's packaging may not be to everyone's taste. It's designed to stand upright on the included stand as shown in the product shot above. But in real life all its connecting cables protrude unattractively from the right side. The front panel holds USB, WAN and wireless indicators for the two radios. You'll have to look at the lights embedded in each of the Gigabit WAN and switched LAN ports for link status and activity. Unlike ASUS' previous top-of-line single-band RT-N16U, which uses a Broadcom-based design, ASUS tapped Ralink to power the RT-N56U. Figure 1 shows all the components encased in an RF shield. Figure 2 reveals some component details. A 500 MHz Ralink RT3662F SoC serves double duty as the main CPU and 5 GHz radio, while the Ralink RT3092 to its left provides the 2.4 GHz radio. A Realtek RTL8367 provides the four-port Gigabit switch and the single Gigabit WAN port. 128 MB of RAM and 8 MB of flash complete the design. Note that while ASUS doesn't spec it, my tests revealed that the Gigabit switch passed 4K jumbo frames just fine. And the RTL8367 spec sheet confirms that it "supports 9216-byte jumbo packet length forwarding at wire speed". This photo provides a closer view of some of the key components. Note that both radios feed a single set of three printed-circuit dual-band antennas. ASUS told me the 2.4 GHz radio uses two antennas (2T2R) and the 5 GHz radio uses three (2T3R) for a bit more receive gain. Aside from having two radios to configure, the RT-N56U's feature set is essentially the same as ASUS' previous top-of-line single-band RT-N16U. So you can check that review for a detailed feature walkthrough and a peek at the web-based admin GUI. Figure 3 shows the main "Network Map" screen, with a USB drive attached. For those of you who care, there is no IPv6 support. A key difference from the RT-N16 is that the USB sharing feature supports SMB file sharing as well as FTP. So shares will show up via network browsing with any device that supports SMB. There's also a built-in UPnP AV / DLNA media server. But there are no controls exposed for the server except for an enable / disable. Note also that if you're planning to use the HTTP, FTP, and BT "Download Master" feature, it's a Windows program, not built into the router. I ran into a few oddities on the Wireless side. The router properly defaulted to 20 MHz bandwidth mode for the 2.4 GHz radio, with the 5 GHz radio defaulting to Auto 20/40 mode. But by default, both radios have the same ASUS SSID, making it impossible to force a dual-band client to a particular band. The other questionable default is that Wi-Fi Protected Setup (WPS) is off. Enabling it was confusing because it appears that there is only one WPS setting for both radios. But when you bounce back and forth between the 2.4 GHz and 5 GHz screens if looks like you can enable WPS on both bands. Enabling WPS appears to change the 5 GHz band SSID to be different from the 2.4 GHz radio's, so at least you can now select a band to connect to. I was able to successfully complete a WPS PIN session with my Win 7 client, which resulted in a WPA2 / AES secured connection. The Professional tab of the Wireless settings shown in Figure 4 contains enable schedules for each radio as well as AP isolation (client separation) and the ability to flip numerous wireless function switches that are probably best left alone. You won't find any Guest WLAN or multi-SSID features, however, which puts the RT-N56U at a disadvantage to other top-end simultaneous dual-band routers like the Cisco Linksys E4200 and NETGEAR WNDR3700.